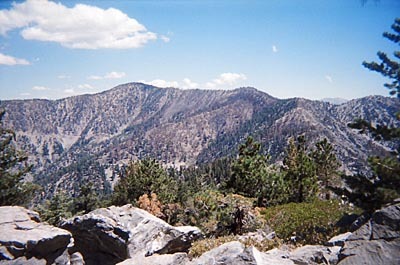 Mount Islip (pronounced "eye-slip") is one of the must-hike peaks of the San Gabriels. From its 8250-foot summit, the hiker is rewarded with a splendid panoramic view in all directions. The pointed and nearly bald summit stands in relative isolation along the high-country backbone, separating the Crystal Lake basin on the south from the vast Mojave Desert to the north. 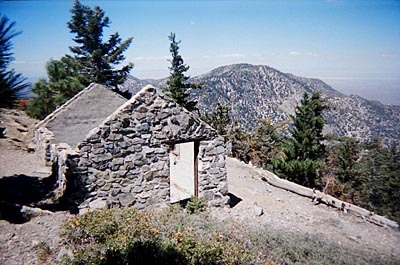 The Forest Service took advantage of the outstanding vantage point of Mount Islip when it built a fire lookout on its summit in 1927, which was moved to South Hawkins in 1937. The concrete footings of the tower and the stone cabin shell still remain. The mountain gets its name from George Islip, an early pioneer who homesteaded in the San Gabriel Canyon in the 1880s. There are a variety of popular routes or combinations of routes that offer fine hikes to Mount Islip (see alternate routes below). The often-overlooked hike presented here is the shortest. It begins at a curve on Highway 2 and takes a direct route straight up the ravine to Windy Gap, about a quarter mile. Then it follows the trail another mile to the peak. 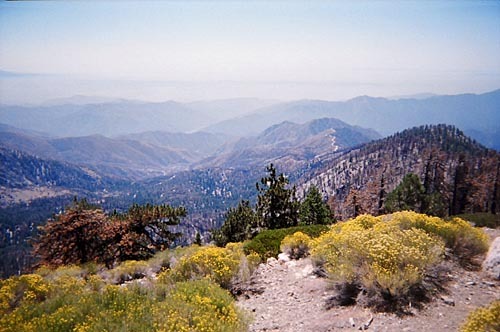 The San Gabriels's high country provides splendid hiking in the summer with plenty of sunshine, pleasant temperatures, and long days. But check the weather reports for possible thunderstorms and make sure you carry the 10 essentials. The area can get a lot of snow in the winter, so check the trail conditions if you're hiking late fall or early spring. Hard snow or ice can linger on the steep, north-facing slopes until sometime in May. You can avoid those areas by climbing straight up the east ridge of Mt. Islip from Widy Gap. However, you may have snow in the ravine Between Hwy 2 and Windy Gap. See Seasons of the San Gabriels for a detailed description of minding the seasons. 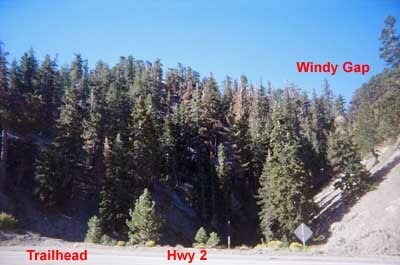 From the Foothill Freeway (I-210) in La Canada, drive the Angeles Crest Highway (Hwy 2) north and east, about 41 miles to Islip Saddle, and continue another couple miles to mile marker 66.37, at a bend in the road. If you're driving on Hwy 2 from the east, the mile maker is 66.38, a few miles past Dawson Saddle. There are turn-outs on both side of the road adjacent to a ravine. Park on either side. The trail begins on the left (east) side ravine. A National Forest Adventure Pass is required for parking. Take the informal use trail on the left side of the ravine under the shade of white fir and Jeffery pine. The easy-to-follow path proceeds in a southwest direction on the left bank. The climb is steep but not precarious. The patch of blue sky directly in front of you marks Windy Gap. When you reach a large fallen Jeffery Pine, you're almost there. After 0.2 mile from the highway, you'll arrive at Windy Gap, a major trail junction with routes heading all directions. From Windy Gap, take the trail that heads northwest, marked with a sign, "Mt. Islip 0.8" (which is incorrect; it should read 1.2). The trail contours the northeast slope of Mt. Islip's long, east ridge. After 0.2 mile, you come to a trail junction. 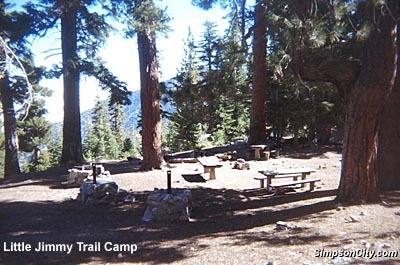 If you continue straight you end up at Little Jimmy Trail Camp in about 0.3 mile. Instead, turn sharp left (south). The sign reads, "Mt. Islip 1.2" (which is incorrect and a discrepancy with the sign at Windy Gap; it should read 1.0. See Trail Notes below). In another 150 yards you reach the crest of Islip's east ridge with great views down into the Crystal Lake basin and beyond. This is the point at which a steep, informal route straight up ridge from Windy Gap meets the trail. Your trail now turns right (west) and traverses just below the ridge, first on the north side of the ridge, then on the south. After 1.0 mile from Windy Gap, you reach a trail junction. If you veer left (southwest), you descend to Islip's south ridge toward Crystal Lake (see South Route 2 below under Alternate routes). But instead, continue straight (west). The sign reads "Mt. Islip 0.1" (which is incorrect, it should read 0.2). The sign also reads "Little Jimmy Campground 1.1" (pointing back toward the trail you just came up). 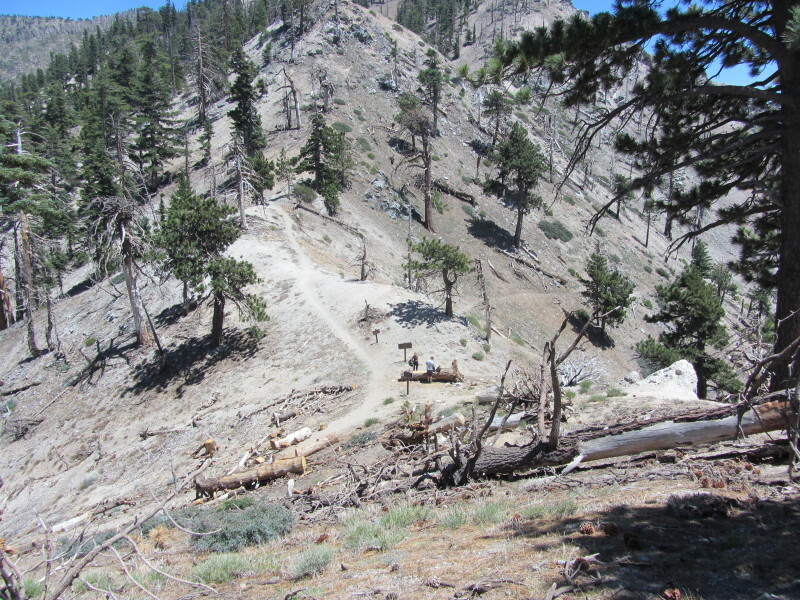 Follow the trail 0.2 mile as it takes you circuitously to the summit of Mount Islip (8250'). Enjoy the views atop of Mt. Islip. To the west, Bear Canyon, the East Peak of Twin Peaks (7761'), and Mt. Waterman (8038'). To northwest, Will Thrall Peak (7845') and Mt. Williamson (8214'). To the north, the Mojave Desert. To the northeast, Mt. Lewis (8396'). Looming on the east, Throop Peak (9138') and Mt. Hawkins (8850). To the southeast, Hawkins Ridge and South Hawkins (7783'). Notice Mount Baldy (10,064) at a distance peeking over the gap on Hawkins Ridge. To the south, Crystal Lake basin, San Gabriel and Morris reservoirs, Smith Mountain (5111') and past the mountains, the San Gabriel Valley and beyond. 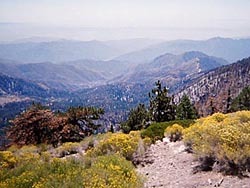 To the south and southwest, Pine Mountain (4539), Monrovia Peak (5409'), Mt. Wilson (5710') and its cluster of front-range peaks. 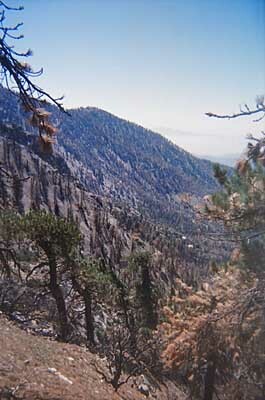 The Curve Fire of September 2002 devastated much of the Crystal Lake basin and the slopes and ridges around it. As you hike to Mt. Islip, from any route, you'll see burned trees and sticks which used to be beautiful displays of manzanita. But you'll also see some trees and shrubs that were spared. And once you reach the summit of Islip, you'll be thankful that it was virtually untouched by the fire. Mount Islip is a splendid peak, well worth the visit. Return the way you came. Topo map note: The USGS map topo (Crystal Lake Quadrangle, 1995) does not show the use trail from Hwy 2 to Windy Gap. 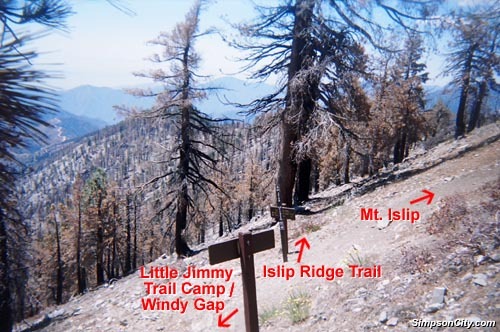 It also does not show the trail from Windy Gap to the upper trail from coming from Little Jimmy trail camp. 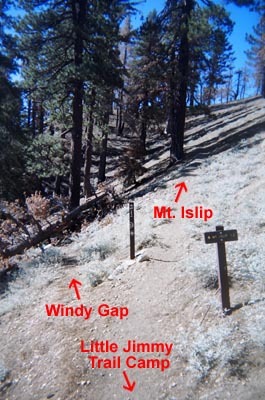 There are two trails from Little Jimmy trail camp to Windy Gap. The lower one is the Pacific Crest Trail, which passes just above Little Jimmy Spring. The upper one splits; one way goes up to Mt. Islip and the other goes down to Windy Gap. The map also does not show Islip Ridge Trail that traverses the south ridge. View larger topo map. Mileage: The sign at Windy Gap reads: "Mt. Islip 0.8." 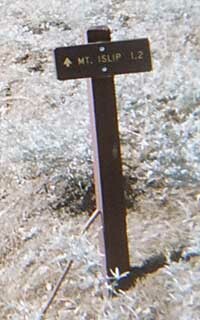 But after following the trail 0.2 mile, the sign at the junction reads, "Mt. Islip 1.2." Both of these signs are incorrect. The Tom Harrison trail map shows 0.8 mile from Windy Gap to the Islip Ridge junction, which is also incorrect (the map may have taken the mileage from the errant sign). North Route 1 - Islip Saddle (Hwy 2) to Little Jimmy Campground via the Pacific Crest Trail, to Mt. Islip - 7 miles rounds trip, 1500' gain (Robinson, Hike 77). North Route 2 - Little Jimmy Campground service road (3N04 at Hwy 2 - mile marker 65.5) to Little Jimmy trail camp to Mt. Islip - 5.6 miles round trip, 1250' gain (Schad, Area A-11, Trip 5). 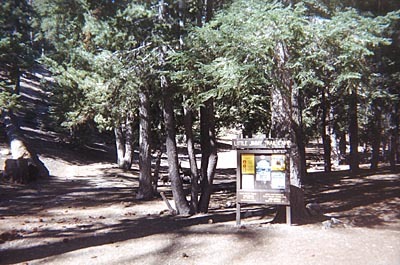 This trailhead is sometimes referred to as Pine Hollow, since it is opposite the now-removed Pine Hollow Picnic Area. South Route 1 - Crystal Lake to Windy Gap via Windy Gap Trail (See Windy Gap Trail description), to Mt. Islip, down Islip Ridge Trail and Big Cienega Trail - 7.5 miles round trip, 2200' gain (See Big Cienega Trail description) (Robinson, Hike 76 | Schad, 101, Trip 30). A variation of this route is to hike it as an out-and-back hike rather than a loop, using either route. The shortest of these is up Windy Gap Trail and then to Mt. Islip and back - 7 miles round trip (Schad,Afoot and Afield, Area A-9, Trip 4). South Route 2 - Crystal Lake to Mt. Islip via Islip Ridge Trail - 9.6 miles round trip, 2675' gain. Not covered in Robinson, Schad, or McKinney. Not on the USGS topo map but it is on the Tom Harrison Map. Fine trail with breathtaking scenary. See Dan's Hiking Blog: Mt. Islip from Crystal Lake Hike - July 15, 2012. 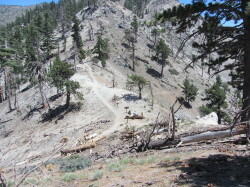 South routes finally opened: The Crystal Lake Recreation Area had been closed by the U.S. Forest Service repairing it from the Curve Fire (Sept 2002) and bark beetles. It was scheduled to re-open in June 2003, then June 2004. Never happened. Then the torrential storms of October 2004 through January 2005 badly damaged Hwy. 39. The FS had hoped it would be open for summer 2006 and did a great job in restoring the Crystal Lake Recreation Area. But CalTrans strung out the road repairs for years. Finally on March 22, 2011, CalTrans re-opened Hwy 39! Read story here. People traffic: 9-6-03 (Saturday) - For the entire hike, I encountered only one party of two hikers; they were coming down as I was going up. They had camped on Friday night at Little Jimmy trail camp. When I did a side trip to Little Jimmy I was surprised to see the camp empty on such a nice weekend. Met three day hikers in one party at Little Jimmy. Total: 5 people in 2 parties. 7-23-11 (Saturday) - There were lots of people summiting Mount Islip: solos, duos, and several groups between 4 and 8 hikers each. 7-15-12 (Sunday) - Islip Ridge Trail to Mt. Islip: No one until the summit - 11 people in 2 parties. Two at Windy Gap and two on Lost Ridge Trail. Remarkably few people for the day.8-8-15 (Saturday) - Lots of hikers on Windy Gap Trail and at Windy Gap. None on Big Cienega and Islip Ridge trails. Two parties on Mt. Islip Trail and one party at the summit. And our party of 27. Highpoint - Mt. 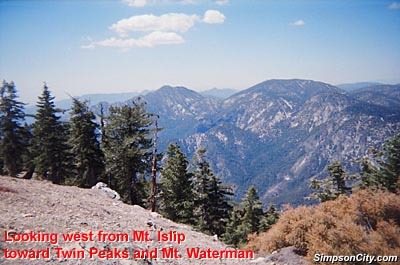 Islip is not a high mountain by California standards, and is only the 19th highest in the San Gabriels, but it is higher than the highest points of 36 states. 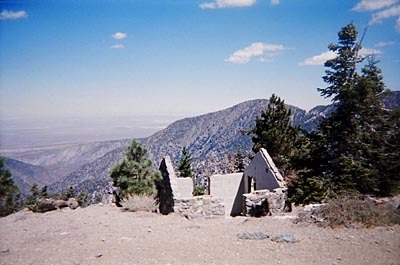 See United States State High Points from peakbagger.com. Hundred Peaks Section, Angeles Chapter, Sierra Club "Mount Islip" - Driving directions and brief route descriptions (3 routes). Good historical background. Their Route 1 corresponds with my Alternate North Route 1. Their Route 3 corresponds with my Alternate South Route 1. This site is the only place I have found that describes the short route (their "Route 2"). They place the distance at 2.5 miles round trip rather than my 2.8. Trails of the Angeles: 100 Hikes in the San Gabriels - by John Robinson with Doug Christiansen (Wilderness Press: Birmingham, 9th edition 2013). Hikes 76 and 77. Good trail descriptions of the alternate routes mentioned above. Good historical background. They incorrectly place the Windy Gap Trail mileage at 2.0 rather than 2.5. 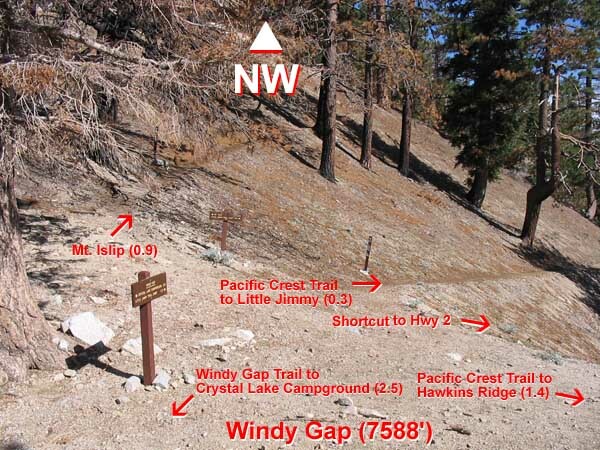 They have corrected the problems with describing the junction at Windy Gap. Afoot and Afield in Los Angeles County - by Jerry Schad (Wilderness Press: Berkley, 1990). Area A-9, Trip 4: "Mount IslipSouth Approach" and Area A-11, Trip 5: "Mount IslipNorth Approach." Good background and trail descriptions from the alternate routes above. Note, his description from Windy Gap is inaccurate and confusing (as was Robinson's before his 9th Edition above). 101 Hikes In Southern California - by Jerry Schad (Wilderness Press: Birmingham, 2013, 3rd Edition). Hike 30: "Mount Islip." Good background and trail descriptions from the alternate routes above. Note, his description from Windy Gap is inaccurate and confusing (as was Robinson's before the 9th Edition above). This is the same trial description as in Afoot and Afield, but he adds description for the new Islip Ridge and Big Cienega trails, making the trip a loop.